Crystex coated ledges for extra protection. 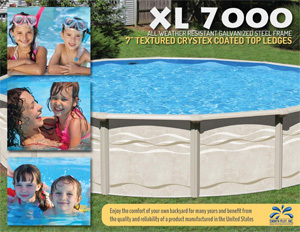 The XL 7000 above ground pool offers an enamel painted galvanized steel frame with textured Crystex coated ledges for extra protection. Made for backyard fun and relaxation. 52 inch hot-dipped galvanized steel wall with several layers or treatment and strengthen with deep corrugation. A clear Crystex sealant gives extra protection to the outer wall and a weather resistant Epoxy Shield safeguards the back. First 3 seasons no charge for parts.